The regional Catalan government plans to declare independence in the coming days from Spain, the latest twist in a constitutional crisis between Spain's central government in Madrid and separatists in the northeast. The whole conflict over a self-determination vote has been dragging on for six years but Catalan separatists finally staged such a referendum on Sunday despite Span's insistence it was illegal and an order by Spain's top Constitutional Court order that it be suspended while judges deliberate on its legality. Spanish police, following orders from a judge to prevent the referendum, clashed with voters and supporters Sunday, resulting in over 900 people receiving medical attention. Photographs and videos of police pulling voters out by their hair and kicking them on stairs flashed around the world, sparking criticism, but Spain says the police did what they had to do. Massive protests and a strike took place Tuesday in Catalonia against the police actions and the situation in the northeastern region is close to boiling point. 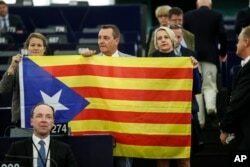 Belgium members of the European Parliament, Anneleen Van Bossuyt, left, Mark Demesmaeker and Helga Stevens, right, display a Catalan flag in support of the disputed independence vote Sunday in Catalonia during a session at the European Parliament. The way the independence referendum was held has raised a host of complaints about its legality and validity. The vote did not have any census controls, electoral board or official vote-counting teams or international observers of any weight. After Spanish police started seizing ballot boxes, Catalan officials allowed voters to vote wherever they liked. Catalan authorities claimed some 2.3 million people — less than half the region's electorate — voted in the referendum Sunday. Many of those opposed to independence are thought to have stayed at home. Of those who voted, some 90 percent voted yes to independence but they are still just 40 percent of the region's total number of voters. 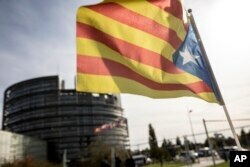 Regional President Carles Puigdemont proclaimed a victory, saying the vote entitled Catalonia to be recognized. Spain cried foul and most governments backed it. A demonstrator waves a Catalan flag in support of the disputed independence vote Sunday in Catalonia during a protest in front of the European Parliament in Strasbourg, France, Oct. 4, 2017. Spain — one of Europe’s oldest countries — has existed with more or less the same borders for some 500 years. But that could change Monday if Puigdemont and his supporters have their way. The regional leader has pledged independence will be declared within days. No one, however, seems keen to recognize Europe's newest state. The European Union has said it won’t and international bodies have uniformly demanded that Catalonia do things the right way and obey Spain's constitution. It’s anybody’s guess what might happen if the prosperous northeastern region of Catalonia does actually try to secede. Puigdemont has not given any clear idea of what the new Catalan state would look like or would do regarding key issues such as borders with the rest of Spain and France, its defense and foreign affairs, tax collection and management of key infrastructure such as airports, ports, rail transport and nuclear stations, most of which are controlled by Spain. Without an agreement with Spain — and that's not on the cards anytime soon — it’s hard to see how the fledgling state could even exit. Many think the declaration could be more a symbolic gesture. Problems would immediately pile up for the new country. The European Union has already said it would be expelled from the bloc and its shared currency, the euro, and would have to reapply to rejoin, a lengthy, uncertain process. On paper, Spain seems to have the upper hand. By law, it’s entitled to take control of any of its regions and suspend their self-governing powers if they are seen to disobey their obligations to the state. A more extreme option would be to have the national parliament declare a state of emergency in Catalonia, suspend civil rights and even impose martial law. Dialogue is a third option — which EU officials have urged — but both sides seem to want their trains to crash head-on first and see who comes out worse.